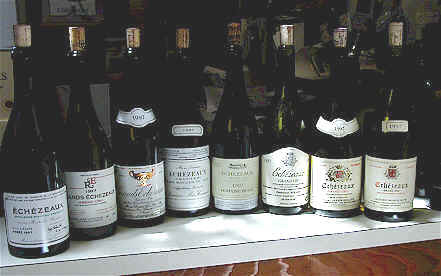 Another Burgundy tasting of the 1997 vintage, we featured wines from the Flagey-Echzeaux area. Echzeaux comprises some 37+ hectares, averaging about 158,000 bottles annually, one of the larger Grand Cru sites in Burgundy. Its more costly big brother, Grands-Echzeaux amounts to another 9.14 hectares and 34,000 bottles in a normal year. The flowering of the vines came early, but was reportedly uneven. A warm August and some early September rains caused a bit of trouble: low acidity due to the heat and a touch of rot due to the moisture. Most top growers viewed this as a medium-term vintage as far as cellaring, noting the wines are rather charming in their youth. This bottle was plagued by a bad cork, which tainted the wine to the point of causing the aromas to be reminiscent of wet cardboard. It is a shame to lose such an expensive bottle of wine to something which is probably the least costly part of the whole package! It can happen to the best of them. "Horsy and barley notes with a bitter and disjointed finish." said the first person to critique this wine. "Tinny, metallic, with sour grass and a shrill astringency." chimed in another. "High acidity, dried orange peel and a clove spiciness." said someone else. Another felt this might have some ethyl acetate dominating the nose, which they viewed as slightly flawed. I found the nose quite pleasant, with floral and intensely fruity elements, along with some sweet oak and a hint of a peppery, spicy note. The wine seemed overly tannic to me, with aggressive astringency and a bit "wiry" and lean on the palate. Perhaps it will round out with time? Coincidentally...we had a bottle of the 1989 of this at dinner Chez Bob after the tasting and it was quite nice. Criticized by more than one person as being "bitter," this wine was further described as having "green tea notes and a dusty quality along with herbs and a saucisson" character (don't ask what kind of sausage). Another person found this to have "unripe" notes and "wild berry, menthol, wet stones and Burgundian earth" characteristics. Someone else found more normal "berry and cherry fruit." I found some herbal and cherry notes with some tannin, but no particular charm to this red. Interestingly, we had a bottle of their 1989 at dinner. In those days the wines were distinctly reminiscent of creme de cassis. Interestingly, the '89 was reminiscent of Bordeaux, while the Engel was decidedly Burgundian. Better yet was Bob's braised lamb and giant beans! From a highly-regarded estate, this wine was described by two tasters as having "silage" notes (we usually have but one fellow who finds farm fragrances in every set of wines!). "Reduced, barnyard, alcohol, spice and a short, soft finish." said one silage advocate. The other found "oat-like note, racy, berry fruit, mushrooms, vanillin and toasty oak." One taster marked this down for having "stemmy notes and green tannins." Another described it as having "bright cherry fruit, a silky texture and complex, but not a powerhouse." Someone else found this to be "velvety." This wine had many fans. "Beautiful, earthy, rose petal aromas." said the first to critique Dujac's wine. Another found fault, saying it "has an odd nose which pervaded the flavors...almost like green pepper." Someone else found "wild strawberries, white truffles, smoky vanillin notes..." Another said "Roses and raspberries and it's soft and expansive on the palate." "Violets and lavender" were found by someone else who felt this had a "tart, hot finish." My notes indicate a wonderfully exotic character, with spices, tobacco, sweet oak and some green, leafy fragrances. On the palate there are some similar characters with loads of fruit, sweet oak and layers of complex flavors. I felt it had 5-10 years of cellar potential and gave it two-and-a-half to three stars. One taster said this extremely costly wine was "too powerful, though it has nice fruit and intensity." Another person found Rouget's wine to have "ripened blackberry notes, laced with tarry fruit, brown sugar notes and some maple syrup qualities." Someone else described this as "California-like Pinot Noir with strawberry fruit and sugar notes." I pegged this as having sweet, ripe fruit and a jammy note, though it lacked "distinction" in this group of wines. Some aggressive tannins matched up nicely on the palate, as this had more depth in the mouth than was found on the nose. Two stars. "Heavily charred oak." were the words of one critic. Another found "celery, orange peel...this is silky and rich, but it tastes burnt due to the oak." Someone felt this was "great...definitely the largest wine with nice complexity." 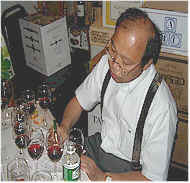 One taster found "coffee notes" with "small black fruit" characteristics. "Sharp, acrid with dark toasty notes and some sulfur...burnt on the palate." said another taster. "It coats the tongue," said one participant, "with slate notes, wet earth, bacon and smoked salmon." My descriptors for this were varied: Floral, rose petal, fruity, orange peel, herbal notes, a band-aid-like fragrance. I liked it on the palate, though it is a bit idiosyncratic with the extreme toasty oak. Lots of richness and sweet vanillin and a very long finish. Two stars. "Sweet, flowery intense fragrances...this is very fine!" 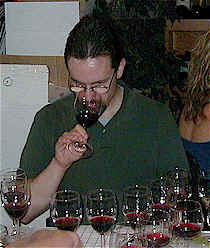 exclaimed the first taster. "I liked its soft mouth-feel, cigar smoke notes, though it is a bit medicinal and has a menthol nuance." said a second critic. Someone else found this to be "rich and velvety." Another found it "silky, with a 'round' texture and some charry notes." I found lovely sweet fragrances with ripe fruits and spices such as cinnamon and anise. The same elements are present on the palate and this has really good depth with plenty of fruit and a balancing amount of oak. Two stars.